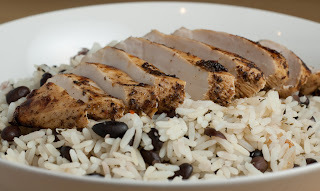 The name of the rice dish I served the chicken with is Moros Y Cristianos. It means "Moors and Christians" and is a bit of a national dish of Cuba. As you can see it is a mix of black beans and white rice. I'll leave it to you to figure out which part symbolises the Moors and which is for the Christians. If you compare the photo and the recipe you'll notice that I didn't have any parsley when I cooked this, I simply forgot it when I shopped. You can also add some cooked chopped bacon or lardons to it if you feel like it. If you don't want to make the marinade you should be able to find some ready made on the supermarket shelf. As always, freestyle the marinade to suit your tastebuds and heat resistance. I haven't given any exact measures, this is something that you need to trial and error until you get the mix the way you want it. Use the force Luke! For the marinade, put all the ingredients into a mixer or use a staff mixer to make a smooth paste. Put the chicken breasts into a plastic freezer bag and coat thoroughly with the marinade. Depending on what strength you want marinade in the fridge from 2 - 12 hours. When ready to cook, heat up a griddle pan until very hot. Wipe off the marinade and fry the chicken on both sides until done. Mix the cooked rice and cooked beans with the parsley and season to taste. Marinated chicken in most forms sound delicious to me, so should this one be. First time on your blog, so hej! This marinade kicks a bit more than most. I love the versatility of chicken - there's no end to the variations really. Hej tillbaka! I'm glad you found your way here and I hope you'll be back.